Arrows will fly. Swords will swing. Heroes will fall. Legends will survive. And the Holy Land will never be the same. 1190 AD: Richard the Lionheart has launched his epic crusade to seize Jerusalem from the cruel Saracens. Marching with the vast royal army is Britain's most famous, most feared, most ferocious warrior: the Outlaw of Nottingham, the Earl of Locksley -- Robin Hood himself. With his band of loyal men at his side, Robin cuts a bloody swathe on the brutal journey east. Daring and dangerous, he can outwit and outlast any foe -- but the crimson battlefields of the Holy Land are the ultimate proving ground. And within Robin's camp lurks a traitor -- a stealthy enemy determined to slay Christendom's greatest outlaw before the trumpets fade. 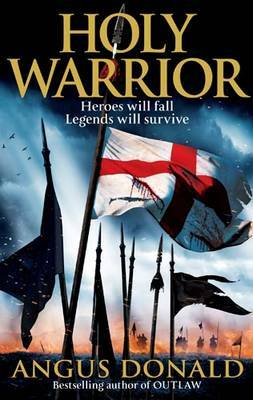 Blazingly paced and richly imagined, featuring a cast of unforgettable characters and packed with fast, furious action, Holy Warrior is adventure at its thrilling, white-knuckle best. If you missed the first title by Angus Donald, make sure that you catch up pretty quick as this title is a definite must read for fans of historical fiction. Our principle hero and Robin Hood are on crusade and with villains and killers popping up out of the woodwork its an adventure and a half. Back that up with our heroes being at the Jewish Massacre of York as well as the Holy Lands and it’s a real journey. Angus’ use of Alan as a natural story teller works well and when backed up with some great dialogue, some interesting twists alongside a great overall arc and you know it’s a new chapter in the Hood Mythos that will enthral a great many new readers. A great series to use as a bridging gap between the Young adult and Adult market and one that will definitely become a firm fav.